Lion Form is the form Sora takes when he visits the Pride Lands in Kingdom Hearts II. 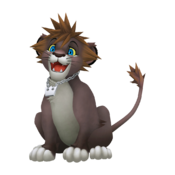 In Pride Lands, Sora takes the form of a lion cub. His fur is predominantly an ashy shade of brown, though his toes, belly, and the fur around his mouth are very light grey. His mane is shaped like his normal hairstyle, and is the same light brown color. There is a tuft of light brown fur on the tip of his tail, and he has three whiskers on either side of his nose. His eyes are bright blue and his sclera are yellow. His silver crown necklace still hangs from his neck in this form, and he holds his Keyblade in his mouth facing his right, though when he opens the world's Gate or he goes in Limit mode with Simba he holds the Keyblade with his tail. Lion Form restricts Sora to standing on four paws rather than two legs. As such, he takes longer strides and Sora is unable to use Growth Abilities in this form. Lion Sora's abilities are different than those in other forms. The Dash ability works very much like the Mermaid Kick ability; the speed gained is pretty much equal to Sora while in Atlantica. Just as in his Merman Form, Sora cannot use any drive forms or summons while in this form. While all of Sora's Action Abilities are replaced with new ones, and his Growth Abilities are removed, all of his Support Abilities remain untouched. Combo Upper Knocks a target into the air during a combo with . Aerial Impulse Tackles and attacks a target in midair during a combo with . Finishing Blast Deals damage to nearby enemies at the end of a combo with . Retaliating Smash When knocked down, quickly regains balance and counterattacks with . Running Tackle Unleashes a rapid tackle on a single target while attacking during Dash. Dash Moves rapidly while pressing down . Combo Plus Increases maximum combo by 1 when on the ground. Equip more to enable more combos. Air Combo Plus Increases maximum combo by 1 when in midair. Equip more to enable more combos. ↑ Reach Wildebeest Valley with Nala. This page was last edited on 7 September 2018, at 01:10.